Recently we found a fantastic taco hut called Haggo’s Organic Taco in Leucadia, CA. In addition to the wonderful chicken, fish and veggie tacos, we loved the side of beans. OK, maybe just me. But, I loved the beans so much that I got inspired to find a good pinto bean recipe and make my own. Cheap, wholesome, filling and yummy! I found a few recipes and tweaked them a bit. 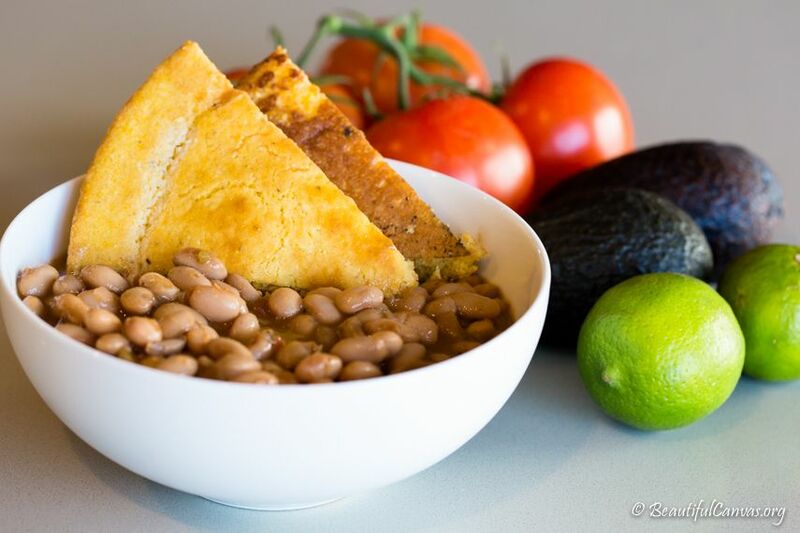 The main recipe I pulled from was a vegetarian Texas pinto bean recipe. Funny considering that every bean dish I ever ate in Texas most definitely had bacon or a ham hock in it. These seem far too…Californian??? Place the pinto beans in a large pot, and pour in the chicken broth and water. Stir in onion, jalapeno, garlic, salsa, cumin, and pepper. Bring to a boil, reduce heat to low, and continue cooking 2 1/2 hours, stirring often, until beans are tender. Sooooooo good! And even better with cornbread. Add chopped tomatoes, avocado slices and a squeeze of lime on top and voila! Yum. This post is dedicated to my brother Kevin who loves beans with a fierce passion.